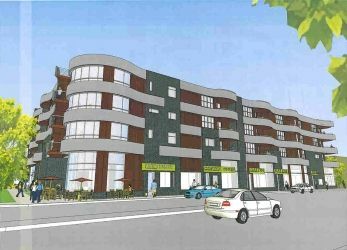 On September 25, the Milwaukee Common Council approved the rezoning of the site at the northwest corner of Holton and Brown for the development of a 53-unit, five storey building. The proposal had been stuck in committee for over a year. Why was it so long in coming? And why, when the development itself received little opposition, was the final, approving vote still a narrow victory of 8 to 6? The answer is laid bare in a comment made by Alderman Mike D’Amato during the discussion preceding the vote that day: “Some people want to make this a referendum on the developer.” The developer in question is Tim Olson of the Olson Management Group. Depending on where you look, Olson owns anywhere from 27 (the number given in a July 2007 listing derived from public records) to more than 80 (the number recently given by Olson himself) properties in Milwaukee. The actual number is hard to ascertain, as Mr. Olson almost always generates a new LLC for each of his properties. This is a perfectly legal practice, but results in the confounding of government agencies responsible for pursuing building code violations. State law protects the holders of LLCs from having their names divulged. Thus the databanks cannot be cross-referenced for actual person’s name when the owner is listed as an LLC. In regard to Tim Olson using this strategy, DNS (Department of Neighborhood Services) Public Information Officer Todd Weiler suggested, “It’s his way of trying to dodge the liability.” Mr. Olson has been doing a lot of dodging. In May 2006 the Milwaukee Journal Sentinel, reporting on the $34,200 fine he’d just received for failure to repair six of his homes, wrote, “It was the twenty-sixth time Timothy J. Olson has been convicted for uncorrected code violations in the last three years. The properties in question had 50 uncorrected violations dating back to 2005, including defective plumbing and electrical systems, safety issues and other maintenance violations.” The numbers only continued to get higher. During the Common Council’s debate at City Hall, Alderman Robert Bauman voiced his concern over Olson’s record. “But there are still 84 outstanding code violations on 14 of his properties, which is the fifth highest total in the city,” he said. Speaking of Olson in a recent interview, Todd Weiler of DNS concurred, saying “He’s one of the most fined (property owners) in the city, in the top ten.” Still, Tim Olson is a viable developer with a number of successful projects under his belt, including the City Lights Condominiums. This seven unit structure in the 1700 block of Palmer Street in Brewer’s Hill boasts a splendid view of the downtown and lakefront areas. The planned structure at Holton and Brown would also afford a view of the city. One version of the plans, which have not yet been finalized, fills the top floor with condominiums. The second, third, and fourth floors would house apartments, while the street level would be available for retail spaces. There is also indoor parking planned for retail employees and condo owners. The attractiveness of the development lies in its promise to serve as a catalyst between the near north and far north areas of Holton Street. “We’ve seen the success of development on Holton near Capitol, and the success of development near Reservoir and the river. We’d like to continue that movement,” explained D’Amato when questioned about his vote for rezoning. Historically, D’Amato has been working for this progression since the days 15 years ago when he was the economic development director for ESHAC (East Side Housing Action Coalition). At that time he’d hoped the work done on Pueblo Foods would have gotten things moving. His vision was that the area would become a mixed-use district with coffeehouses, bakeries, and restaurants. “We’ve waited a long time,” he said. And it looked like Tim Olson may be the one to get that ball rolling. But first he had to pay the city what he owed. That came to $318,000 in overdue property tax payments and $37,000 in overdue fines for uncorrected code violations. Days after his payment was received, the issue came before the Zoning and Neighborhood Development committee, where it received a tie vote of two to two. Then, with a Department of City Development recommendation for zoning approval for the project, it was debated and voted on in a meeting of the Common Council, where its passage paved the way for the development. Alderman Willie Wade voted in favor of rezoning because Olson had complied with the requirements that the committee had given him. “He did exactly what we told him to do,” said Wade, referring to the clearing of his debt to the city. “We could have said, ‘Because of your history with the city we’re not going to work with you,’ but we didn’t.” Bauman, a “no” voter, told his fellow Common Council members: “He may be a great developer, but he sure is a lousy landlord. This affects thousands of the mostly low-income residents of his properties.” Alderman Ashanti Hamilton offered some thoughts regarding his “no” vote: When you’re put into a position where you are capable of alleviating a lot of problems with your properties — you can afford to and you choose not to — the people living in those properties and the people living next to those properties, across the street… have to look at those violations, live with those violations, day in and day out. And you just choose to ignore them because it’s financially beneficial for you to do so. Then as soon as you want the city’s support…to do development that’ll make you even more money, it’s at that time that you choose to take care of the fees, but still there are so many outstanding violations on those properties. I think that should be your first priority…maintaining the properties that you have along with paying the fees, not just doing the minimum that’s necessary for you to complete a project. I think too often developers put profit over people. It makes for a bad situation for the people who have to live in those communities.” The Holton and Brown location is in the 6th Aldermanic District, currently represented by Michael McGee, Jr. Back in April, before McGee was incarcerated, he appeared at a City Plan Commission hearing on the Olson proposal, along with several 6th District residents who testified against it. At McGee’s request, David Krey from DNS detailed Olson’s then current list of unpaid fines and unfixed violations. This convinced the CPC to delay approval at that time. As of this writing, “Olson has four properties with 32 violations total,” reported Weiler. “The items remaining are big and expensive, like rebuilding three-story concrete porches. The inspector reports that he is getting a very positive response from Mr. Olson.” The controverisal developer is now paying his debts to the city, but financial issues loom on another front. The October 16 issue of the Journal Sentinel reported that, “Wauwatosa Savings Bank has filed nine foreclosures seeking nearly $11 million dollars from Timothy J. Olson.” The properties in foreclosure are mostly on the East Side, and do not include the Holton property. Olson has also announced plans to buy and renovate a seven-story building in Walker’s Point, adding an eighth floor to place six penthouses in his upscale apartment venture. This summer he broke ground for two smaller projects, a $2 million development in Brewers Hill and a three-story apartment building on N. 16th Street near the Marquette campus.